There are at least two artists that go by the name of Alphaville: 1) Alphaville is a German synthpop/-rock music group which gained popularity in the 1980s. The founding members were Marian Gold (real name Hartwig Schierbaum, born May 26, 1954 in Herford), Bernhard Lloyd (real name Bernhard G? ?ling, born June 6th, 1960 in Enger, Bielefeld) and Frank Mertens (real name Frank Sorgatz, born October 26, 1961 in Enger, Bielefeld). The band was at first named Forever Young. 1) Alphaville is a German synthpop/-rock music group which gained popularity in the 1980s. The founding members were Marian Gold (real name Hartwig Schierbaum, born May 26, 1954 in Herford), Bernhard Lloyd (real name Bernhard G? ?ling, born June 6th, 1960 in Enger, Bielefeld) and Frank Mertens (real name Frank Sorgatz, born October 26, 1961 in Enger, Bielefeld). The band was at first named Forever Young. The band is best known for its two biggest hits, "Big in Japan" and "Forever Young", which was the theme for many high school proms in the 1980s. In 1984 the re-named Alphaville released their debut single "Big in Japan", followed by "Sounds Like a Melody" and "Forever Young", quickly followed by the album Forever Young. Despite its success Frank Mertens left the band in the same year and was replaced by Ricky Echolette (born Wolfgang Neuhaus, in Cologne, August 6, 1960) in January 1985. "Big In Japan" was their biggest U.S. success, shooting to #1 on Billboard's Dance chart. While they never again had a Top 20 U.S. Dance hit, several of their releases went Top 40 and Top 30 on the Dance charts. They were less successful at mainstream U.S. radio, reflected by their showing on the Billboard Hot 100 Singles charts, where "Big" only reached #66. The first U.S. release of "Forever Young" failed to scale the charts. In 1985, amid reports pop star Laura Branigan was featuring the song on her next album, Hold Me, Alphaville's "Forever Young" was re-released as a single in the U.S., and again floundered in the lower recesses of the chart. Branigan's version, though promoted on stickers adorning the album, subsequently remained an album cut in the U.S., though it was released to radio in South America. She would go on to perform the song as an encore at nearly every concert she performed, from her 1985 tour until her death in 2004. The Alphaville version was released a third time in the U.S. in 1988, to promote Alphaville: The Singles Collection, and peaked this time at #65. Their highest U.S. Singles chart showing, it was also their last. International re-releases of Alphaville's "Forever Young" followed in 1989, 1996, and 2001. Several covers have been recorded and remixed, featuring male or female vocalists often erroneously attributed to be Alphaville's Marian Gold, or Laura Branigan. In 1986 the second album Afternoons In Utopia was released, followed in 1989 by The Breathtaking Blue. As an alternative to individual music videos, the band enlisted nine producers, among them Godfrey Reggio (Koyaanisqatsi), to create a film entitled Songlines based on the album's tracks. The next album, Prostitute, was not released until 1994. In 1996 Ricky Echolette left the band. Salvation followed in 1997. Stark Naked and Absolutely Live was released in 2000, followed by the remix album Forever Pop in 2001. A DVD was released in 2001 documenting two concerts performed in Salt Lake City, Utah. Two box-sets have also been released; rather than being collections of previously released album tracks they are actually 12 unique albums, several live, several rarities and outtakes, and several newly recorded. The first box, of eight discs, was released in 1999 (called Dreamscapes) and the second in 2003 (called CrazyShow or Dreamscapes 9-12). All the material in CrazyShow is newly recorded. Bernhard Lloyd did not contribute to the CrazyShow album, and shortly after its release, on March 18, 2003 he officially left the group. 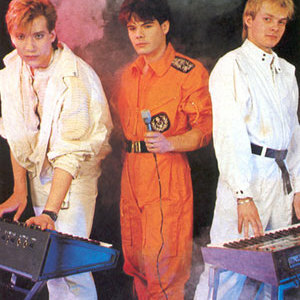 The current core members of Alphaville are Marian Gold (vocals), Martin Lister (keyboards), David Goodes (guitars) and Pierson Grange (drums).
" Just a note to say Bernhard Lloyd is/has/recently played live with Alphaville. I saw him at the Esbjerg Rock Festival in June of this year. They sounded absoutely brilliant. Check out the Alphaville website, it's worth a look. Added by Fletchie, 02.11.07"
Marian Gold has released two solo albums (So Long Celeste, 1992 and United, 1996) alongside his work in the band. Bernhard Lloyd also worked on a project named Atlantic Popes with singer Max Holler. In 1996 Frank Mertens started on a musical project called Maelstrom which was a combination of ambient-style music, impressionistic and colorful art in the form of paintings and sculptures, and etheric poetry. This project seems now to have been by far abandoned, though, as Mertens has not been visibly active with it. In 2006 and 2007, Alphaville appeared on the "ELEKTRISCH" vol.1 and 2 album compilations with "From Germany with Love" and "[track artist=Alphaville]Guardian Angel[track]". 2) A spanish Synthpop/dark/post punk group born in 1981 in Madrid by Jos? Luis F. Abel (guitar & vocal), Mendi (bass), Jos? Carlos ?Charles' S?nchez (keyboards), Jose Luis Orfanel (guitar) and Juan Antonio ?Rep' Nieto (drums). The independent label DRO released their first EP in April 1982, "Paisajes nocturnos", which included four tracks. Their first hit arrived some months later with the 4-tracks 12'' "Palacio de invierno". In 1983 they released the album Despues De La Derrota.